It's a beautiful day, but still a bit chilly. To make sure I don't get too cold on the bike I have toe warmers, a new aero-helmet (which keeps the head warmer) and a high-tech racing jacket which Robin got for me and even screened the FCA-Endurance logo on it. 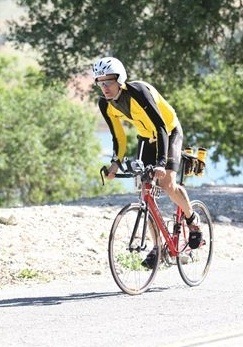 If I'm cold in the swim, I'll use the jacket on the bike and take it off before the hot Nasty Grade section. Ever since the kidney donation I am a little more sensitive to the cold. Getting older is also a factor. So I'm planning better for it now. At the race start, the announcer, Julie Moss, is telling the crowds my story about the kidney donation (almost 2 yrs ago now). 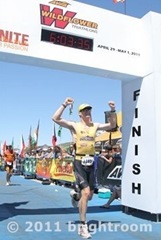 It was published in the online race program and surprised many including Julie who knows us pretty well from the many Tri-California events we go to. I swim a little a few waves early to make sure I have time to warm back up before my start. Waiting amongst my group I have a great reunion with Kiet Tran, Jim Grant, Jeff Fieldhack and Mark Cosgrove. We've all been racing together since the 90's and it brings back great memories to see them all. I'm glad to be racing with TeamMate, David Blackmon, again. Last year we were so close on the bike. He's gotten even faster so I'll be trying to stay with him. Right before my start I see Dale Jackson. It's a great encouragement. So glad to see him racing his 25th Wildflower I think! I pray and give the race to God. Thinking I'm not that fast in the swim anymore, I line up a few rows back. But when the gun goes off, this turns out to be a mistake. It's very congested. I survive ok but think closer to the front would have been better. I'm trying to swim efficiently and steady, with little surges just to make sure I'm still pushing. But I'm not drafting like I used to. Hard to focus on swimming and looking for people to follow. I swim most of it on my own. 1/2 way through I'm getting cold. Strange because the water isn't that bad. I'm definitely wearing my jacket when I get back. We hit a lot of seaweed & debris on the way back.. churned up from a boat or something. 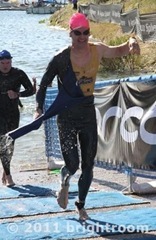 I do a big push to shore and come out with a surprisingly good time of 32min. But then I botch up my wetsuit removal and end up with both feet stuck, entangled in wetsuit. Robin has the best 2-kick exit.. I just didn't have the energy left to kick hard. Finally I get free and jog to transition. With my jacket on I see Dave Blackmon already exiting transition. Ok, let's go get him! I clip in with some significant swerving.. still disoriented from the swim effort and heavy breathing. The crowds are great as we start off through the chute. Going up Beach Hill I have to stand a lot. Later I would realize I have the wrong cog set on with a 21 max. Ouch. Out on the course I'm perfectly comfortable in my jacket and riding fast with my aero helmet. I read the FCA-Endurance signs with scripture and encouragements. Really helps. At 18 miles, the head wind from the North is fierce. I push knowing that once I turn East it should get better. Nope.. it still feels like a headwind. Soon, we head more South and then it will be great! Dave Blackmon is up ahead. At times I could see him but I can't catch him. Suddenly I see a group of riders stopped ahead. The side-wind has become treacherous. I pray that the downed rider isn't Dave. I'm relieved when I can tell it's not. But now is the question of stopping or not. I want to catch Dave and there's already people helping him.. but I just spoke about this at Iron Prayer to day before so it's a must. Always must stop. He's hurt pretty bad with possibly a broken hip/leg. There is a team of fire-fighters racing today and one of them is already helping the riding, making him comfortable and asking questions. Soon another fire-fighter stops. I think that their team isn't going to do too well today because all their athletes will be helping people along the course. 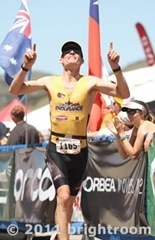 I think about what I can do and remember the conversations that followed Robin's first-aid stop in the Hawaii Ironman. People suggested to just let the person know you're there.. comfort them. So I put some biking gloves under his head and told him everything's going to be all right. The police and ambulance arrived quickly and I continued on my way glad he was in good hands. I lost less than 3 minutes and was determined to still catch Dave. I was surprised how difficult the wind was. I was expecting it to improve. I'm working hard and ran out of my sustained energy drink. Should have had 2. I grab a Gatorade and jug it, but then start feeling a little sick later. I do my best to keep pushing. My average is 2 mph slower than the goal. It's a tough day. After my favorite flat section on the back I finally get to the canyon section at mile 34. Tail-wind finally. I use the reprieve to take off my jacket and tie it around my waste. A friend of Helen Barker's goes by and introduces himself and says he liked the kidney article. At mile 40 I'm feeling better and making good time. An RV gets in the way for a bit but soon I'm on Nasty Grade. Maybe I'll see Dave here! I have to stand the 2nd 1/2 but try to be efficient anyway. At the very top, Mile 43, a fellow TeamMate, Justin, also tells me he liked the kidney article. We talk for a bit and then I fly down the huge descent. The last 8 miles is a key section. I do well, really pushing myself. The last climb into the park is also key and I pass a few guys. Finally I descend down to the lake, drink all my fluids, and stretch the calves a bit. The dismount always hurts a little as the legs transition from biking to running. Quick transition and now I'm running and not feeling too bad. I see Victoria (Dave Blackmon's wife) cheering and taking pictures of me. Hmm, no clue as to how far ahead Dave is. I'm looking for him. First mile is good but it's starting to feel hard. How am I going to go 13mi? Don't think about it. Just focus on God and going 1 mile at a time. I see Mark Cosgrove and run a hill with him. I push well on the trails. At mile 4, I make a goal to pass 10 people on the next hills to mile 5. I never stop running even when the grade is bitter steep. I actually do pass 10 people! Now it's down into the pastures. This is mentally tough here but I think "at the next aid station I might start feeling much better". You never know what's going to happen.. who you're going to see, etc. Sure enough I end up talking to a runner after the aid station and then pick it up. Another runner latches onto me.. shadowing me up the hill next to the park entrance. I don't let it bother me.. just run my own race as well as I can. I stay ahead and finally get to the peak.. Mile 7.5.. amidst all the cheering campers! They're great. Mile 8 takes us back onto the trails. Then more campers but I'm struggling now. Eating Hammer Gel. I see famous coach and friend, Muddy Waters, as I turn back onto the paved road. And way up ahead is... Dave! I also see Jim Grant as we pass through an aid station. I encourage him as he starts walking. He's a tough competitor but sometimes the race doesn't go as planned. On the long downhill I know I'll make strides on Dave. We had talked earlier about how he doesn't like the downhills. I catch up with him and we run together the rest of the way down. It's great to have a TeamMate to run with and I'd rather run the whole way with him than try to beat him. He insists that he's going to take it slower and I should go on so with that I dig in and try to put this last hill behind me. I read the FCA-Endurance sign about "My grace is sufficient". I am about to cry because I think about how self-focused I was the days leading up to the race. I made Robin feel like everything had to be my way because of my big race.. when really God's grace is sufficient and I should just appreciate that God healed me 1-1/2 years ago so I could run pain-free right now. Now I want to finish even faster in order to see Robin, apologize and give her a kiss. Yay! Mile 11, at the top. 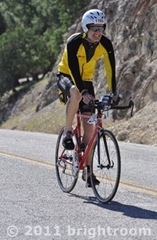 I see Jeff, an athlete I trained with at the ICTN Christian Triathlon Camp in January. He passed me on mile 2 of the run and now we're side-by-side. We're both flying (well, 7:30 pace, but feels like flying). I think of the "Iron War" between Mark and Dave. I read the FCA-Endurance signs out loud. Mile 12 is at the top. It's the "finish" in my mind. I'll make my move there. Jeff and I encourage each other to push it to the top. I'm able to pull ahead, giving it all I have, but another guy comes up from behind and passes me. Wow, he's really moving! The downhill is an advantage for me so I smile and lean into it. Soon I'm flying down it, barely out of control. But it's working. I catch him, and then another, and another! I come flying around the corner and into the chute. Wow, that's all I had, an exhilarated race. Thank you Lord for making it all possible. I did find Robin quickly and she accepted my apology.. now ALL is good!